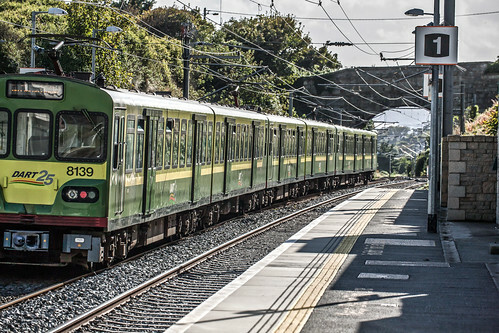 Killiney Railway Station (Ireland), originally uploaded by infomatique. The coastal areas of Killiney are often favourably compared to the Bay of Naples in Italy. This comparison is reflected in the names of surrounding roads, like Vico, Sorrento, Monte Alverno, San Elmo, and Capri. On clear days, the Mourne Mountains of County Down can be seen. Killiney Hill Park was once part of the estate of Killiney Castle, now a hotel. North-eastern Killiney is one of Dublin's most exclusive residential areas. Famous residents include U2 members Bono and The Edge, Enya and occasionally former racing driver Eddie Irvine. Killiney is also home to a number of foreign ambassadors to Ireland. Since early 2010 a pod of bottlenose dolphins has been seen regularly in Killiney Bay. Killiney Hill Park was opened in 1887 as Victoria Hill in honour of Britain's Queen Victoria's 50 years on the throne. The park boasts magnificent views of Dublin Bay, Killiney Bay, Bray Head and the mountain of Great Sugar Loaf (506 m), stretching from the Wicklow Mountains right across to Howth Head. The Park's topography is quite dramatic and its highest point, at the obelisk, is 170 metres above sea level.